White House officials and congressional aides will meet again Sunday to continue discussions about how to end the partial government shutdown that has affected hundreds of thousands of federal workers and caused delays and inconvenience for Americans. The shutdown has entered its third week. The crux of the discussions is border security. President Donald Trump is adamant that he wants $5.6 billion to build a wall on the U.S. border with Mexico to block undocumented migrants trying to enter the U.S.
Trump tweeted late Saturday that he is going to Camp David Sunday to discuss border security and other topics with senior staff. U.S. congressional leaders and White House officials held talks Saturday in Washington in an effort to end the partial shutdown. Discussions ended a few hours later without any progress. White House senior adviser Jared Kushner, Homeland Security Secretary Kirstjen Nielsen and Vice President Mike Pence talk as they walk down the steps of the Eisenhower Executive Office Building on the White House complex, Jan. 5, 2019, in Washington. Senior White House adviser, and Trump son-in-law, Jared Kushner, and Homeland Security Secretary Kirstjen Nielsen were involved in the meeting Saturday, with Nielsen briefing those in attendance on border security. Democrats asked DHS for written details about the agency’s budget needs, which the White House said it would provide. Vice President Mike Pence, who also participated in Saturday’s meeting, described the discussions as “productive” in a tweet. Trump has threatened to bypass Congress and declare a national emergency in order to get the wall built. FILE - Vehicles roll into the Gateway National Recreation Area-Sandy Hook near a sign at the entrance warning visitors of limited services such as closed restrooms during the partial government shutdown in Highlands, N.J., Jan. 3, 2019. About 800,000 federal workers have been furloughed or are working without pay. This is the fourth-longest government shutdown — partial or full — in the past 40 years. The president has said he is willing to continue the shutdown “for years” until there is funding for the wall that he promised Mexico would pay for during his successful presidential campaign. The shutdown has affected government services around the country and if it continues there could be dire consequences. Money for the food stamp program, which helps millions of low-income Americans buy food, will expire in March. Federal income tax refunds and tax return processing will also be delayed. Transportation Security Administration officers work at a checkpoint at Logan International Airport in Boston, Jan. 5, 2019. 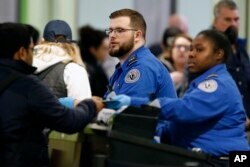 Transportation Security Administration agents who screen travelers at the nation’s airports have begun calling in sick in apparent protest at being required to work without pay. Federal courts will run out of money Jan. 11, according to the administrative office of the U.S. courts. That could delay trials. The shutdown has already resulted in the suspension of issuing marriage licenses in Washington. 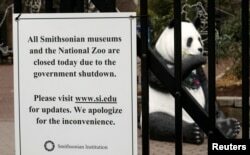 The figure of a panda is seen behind a sign telling the public that the National Zoo is closed due to the partial government shutdown in Washington, Jan. 2, 2019. The Smithsonian museums in Washington, including the National Zoo, are closed. Late Thursday, the Democrat-controlled House passed legislation to reopen the federal government and fund the Department of Homeland Security until early February. The measure did not include the $5.6 billion the president has demanded for the border wall. The Senate passed an identical bill last month, while Republicans still controlled both chambers of Congress. Democrats have said they will only discuss border security once the government is reopened. Trump, who was not part of the negotiations, spent Saturday morning tweeting about the partial shutdown and border wall. Trump said, again without evidence, the 800,000 federal workers affected by the shutdown want him to “keep going” for border security.